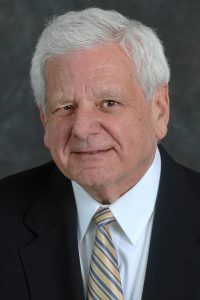 The California Council on Science and Technology (CCST) has added Albert Carnesale, UCLA chancellor emeritus and professor emeritus of public policy and mechanical and aerospace engineering to its Board of Directors. Also joining the board, which provides strategic vision and direction for CCST, is Alexandra Navrotsky of UC Davis. “Dr. 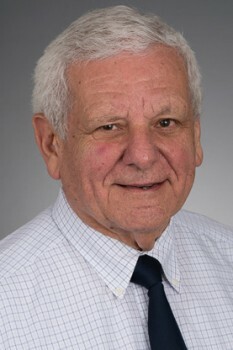 Navrotsky and Dr. Carnesale have made exceptional contributions to their respective scientific fields and applications on the global stage,” said CCST Board Chair Charles F. Kennel in a news release. “Their deep insights and experiences into the societal importance of science and technology will greatly inform CCST’s mission and service to state leaders in California.” Carnesale joined UCLA in 1997 and was chancellor through 2006. He is the author or co-author of six books and more than 100 articles on a wide range of subjects, including national security strategy, arms control and nuclear proliferation. CCST is a nonpartisan, nonprofit organization that engages experts in science and technology to advise state policymakers. In a list of achievements in public service spanning nearly four decades, Albright most notably served as President Clinton’s Secretary of State from 1997-2001. When she was unanimously confirmed by the Senate, she became the first woman to hold that position, and at the time was the highest ranking woman in the history of U.S. government. Former Massachusetts Governor and visiting professor of public policy Michael Dukakis introduced Secretary Albright, describing how much he had enjoyed working with her during his 1988 presidential campaign. 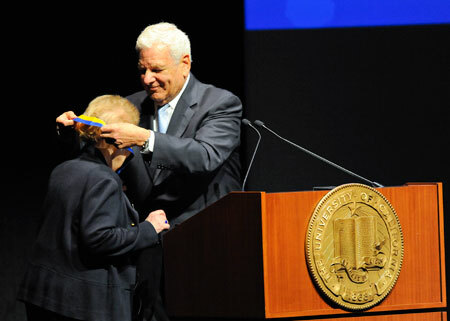 Albert Carnesale, a professor of public policy and engineering and former Chancellor of UCLA, then presented her with the UCLA Medal, an award given to those who have not only earned academic and professional acclaim, but whose works also illustrates the highest ideals of UCLA. Upon receiving the honor, Albright joined Presidents Bill Clinton and Jimmy Carter, Los Angeles Mayor Tom Bradley, and basketball coach John Wooden in the exclusive club of UCLA Medal recipients. Albright’s keynote address focused on the difficulty of creating effective foreign policy in the face of rapid technological change and growing global interdependence. These two megatrends, as she described them, are difficult to address from a policy standpoint because they create their own contradictions. They both share the potential to foster international cooperation and understanding, she said, and yet in many instances they have hardened sectarian, ethnic and regional divisions. Conscious of her audience of students, Albright described her remarks as centering on “the challenges facing the next generation of global leaders,” saying “given all that’s happening across the globe, we have an awful lot to talk about. “The world’s a mess,” she summarized. Despite these weighty pronouncements, her light-hearted nature, sense of humor and inspiring closing statements made it clear that she retains an optimistic outlook for the future. “Higher stakes mean greater rewards,” she said. “The leaders of today and tomorrow have a chance to examine the options before us, discard what is broken, adapt what can be made to perform better and create new mechanisms where they are needed so that the global system benefits us all,” she said. In his opening remarks, UCLA Luskin Dean Franklin D. Gilliam. Jr., stated that “The mission of our school is to change the world. We do that by training the next generation of transformative leaders.” Albright echoed Dean Gilliam’s sentiment, recognizing the potential of Luskin’s students to do just that. Describing the leaders that the 21st century landscape requires, Albright stated that we need “leaders who bring a broadened understanding of their role…men and women who understand the connections between policy, planning, and social welfare…who recognize the need for an interdisciplinary approach to an interdependent world. “The Luskin School is the kind of place in which those leaders will be forged,” she said. Early in her address Albright noted that she was particularly looking forward to the question and answer portion of the evening’s event. She explained that since she is no longer in government she was excited to be able to actually answer the questions students and members of the public asked her, and her answers were nothing if not candid. 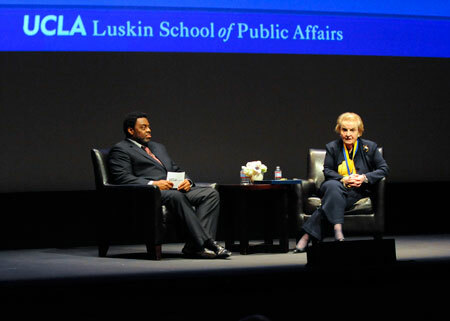 After a conversation with Dean Gilliam in which the two discussed a series of topics ranging from the Syrian conflict to the revelation of National Security Agency spying practices to her father’s mentorship of Condoleezza Rice, Albright fielded questions from the audience, the majority of which came from UCLA Luskin students. The questions touched on specific policy issues as well as covering more general inquiries about the experience of being one of the few women in the corridors of power. Lance Cpl. J. Vincent Barcelona, a Marine Reservist and a third-year undergraduate student, asked Albright what force she would recommend President Obama deploy in Afghanistan as he prepares to withdraw combat troops by the end of 2014. After thanking him for his service, Albright said she didn’t know of the exact number, but she knew it was important to protect the United States’ investment in the country. She also spoke of her own experience advising on military action, and how seriously she and others in her role take the responsibility of sending young people to war. “There’s a special place in Hell for women who don’t help other women,” she said. Former U.S. Secretary of State Madeleine Albright will present remarks and participate in a public discussion hosted by the UCLA Luskin School of Public Affairs, Wednesday, Jan. 29, at 7 p.m. at UCLA’s Royce Hall. Prior to her address, presented as part of the Meyer and Renee Luskin Lecture Series, Albright will receive the UCLA Medal, the university’s highest honor, from former UCLA Chancellor Albert Carnesale. When President Bill Clinton appointed her as Secretary of State in 1997, Albright became the highest ranking woman in the history of the U.S. government. She led the country’s diplomatic corps during a dynamic period of expanding global engagement, advocating for democracy and human rights around the world. Her other government experience includes service as the U.S. Permanent Representative to the United Nations and as a member of President Jimmy Carter’s National Security Council. Today, Albright is chair of Albright Stonebridge Group, a global strategy firm, and chair of Albright Capital Management, an investment advisory firm focused on emerging markets. She is also the Mortara Endowed Distinguished Professor in the Practice of Diplomacy at Georgetown University’s School of Foreign Service. She chairs both the National Democratic Institute for International Affairs and the Pew Global Attitudes Project and serves as president of the Truman Scholarship Foundation. In 2012 President Barack Obama honored her achievements with the Presidential Medal of Freedom. The UCLA Medal is bestowed on those with exceptionally distinguished academic and professional achievement whose bodies of work or contributions to society illustrate the highest ideals of UCLA. Recipients have included national and international leaders in government, education, science, industry and the arts. Previous recipients include Nobel laureates, President Bill Clinton, UCLA alumnus and Los Angeles Mayor Tom Bradley, basketball coach John Wooden, U.S. Supreme Court Justice Harry Blackmun and UCLA alumnus and astronaut Anna L. Fisher. In her lecture, “The Next Generation of Global Leadership,” Albright will apply her unique perspective to the pressing questions of equality, democracy and leadership that face the next generation of diplomats, elected officials and public intellectuals. Her address will be followed by a question-and-answer period moderated by UCLA Luskin Dean Franklin D. Gilliam, Jr. The event is the latest in the school’s signature Luskin Lecture Series, which has featured speakers including former Vermont Gov. and Democratic presidential candidate Howard Dean, New York Police Commissioner William Bratton, and Children’s Defense Fund founder and president Marian Wright Edelman. Please note: This event is sold out. Click here for more information. Chancellor Emeritus Albert Carnesale has been selected to serve on a high-level national commission that will study and make recommendations for developing a safe, long-term solution to the serious problem of managing the nation’s nuclear waste. President Obama directed the U.S. Department of Energy to form the 15-member Blue Ribbon Commission on America’s Nuclear Future to conduct a comprehensive review of policies for managing the country’s current and future stockpile of nuclear waste after the administration decided not to proceed with the Yucca Mountain (Nevada) nuclear waste repository. “The decision to pursue the Yucca Mountain plan was made 20 years ago,” Carnesale said. “From a scientific and technological perspective, much has been learned since then about radioactive waste and how spent nuclear fuel can be treated. And much has also been learned about the Yucca Mountain site itself.” The residents of Nevada also vehemently opposed the plan for a number of reasons. The question of what to do with the country’s nuclear waste has grown in urgency because of climate change and the nation’s search for a cleaner source of fuel. Currently, spent nuclear fuel is being stored at more than 100 nuclear power plants throughout the United States. These plants provide about 20 percent of the nation’s electricity. “I don’t think there are many people who think that is a very good long-term solution to the waste problem,” Carnesale said. “The solution won’t be found in science and technology alone,” Carnesale said. The commission is co-chaired by former Indiana Congressman Lee Hamilton and Brent Scowcroft. Hamilton is a member of the President’s Intelligence Advisory Board and the President’s Homeland Security Advisory Council, and he previously served as vice chairman of the 9/11 Commission (National Commission on Terrorist Attacks Upon the United States). Scowcroft, a retired lieutenant general in the U.S. Air Force, served as National Security Advisor to both Presidents Gerald Ford and George H.W. Bush. Carnesale, who has a Ph.D. in nuclear engineering, holds professorial appointments in UCLA’s School of Public Affairs and Henry Samueli School of Engineering and Applied Science. Earlier in his career, he represented the United States in high-level negotiations on defense and energy issues, including the Strategic Arms Limitation Talks, SALT I. He has been increasingly called upon by the government for his expertise on public policy issues that have scientific and technological dimensions. Since leaving Murphy Hall as chancellor, he has led committees formed by the National Academies, the nation’s science advisors, to analyze, make recommendations and brief policymakers and Congress on vital issues. In 2008, he chaired a committee that looked at whether the nation needs a non-nuclear weapon with the ability to strike a target anywhere in the world within one hour after the president gives the order. Recently, he has been holding classified briefings with representatives from the departments of Energy, Defense and Homeland Security as well as others on Capitol Hill on the findings of a committee he chairs on nuclear forensics. Carnesale is also chair of the Committee on America’s Climate Choices, a nationwide project launched by the National Academies at Congress’ request for policy-relevant advice, based on scientific evidence, to help guide the nation’s response to climate change. That project, which involves some of the country’s leading researchers on climate change, is scheduled to release its report in September. The country’s leading researchers on climate change came to Westwood recently to give the public a chance to learn and ask questions about the current science on climate change, options facing the United States and the work of the Committee on America’s Climate Choices, the group that sponsored the event Jan. 13 at the W Hotel. The committee, which is chaired by Chancellor Emeritus and Professor of Public Policy Albert Carnesale, is leading a nationwide project launched by the National Academies and requested by Congress to provide policy-relevant advice, based on scientific evidence, to help guide the nation’s response to climate change. America’s Climate Choices involves four panels of experts in addition to the main committee, representing government, the private section and research institutions. They are evaluating strategies available to limit the magnitude of future climate change, to adapt to its impacts and advance climate change science, among other goals. The open session in Westwood was one of a series of town hall discussions held in Irvine; Boulder, CO; Washington, D.C.; and other cities. A final report will be released sometime this summer. Read the story at UCLA Today.